No, we (who are seen by some as “Liberal” Christians) do not believe in a sissified Jesus. We follow a Jesus who died for us. A Jesus who will never let us go, and a Jesus who loves us no matter what. That kind of love, that walks through any fire, endures any cross, is an uncompromising and fierce love. This is a Jesus who’s Gospel – in whatever form it may take – is for all, not just for some. You know, loving others is hard. Loving those lost in grief or pain, loving those who have turned away from the world out of their illness or fear or abuse, is hard. Loving those who are different from us; who’s ways are alien to us; who’s politics or faith, or piercings and tattoos, are offensive to us; is hard. Loving people when they shout at you, when they refuse to hear what you have to say, when they call you ugly names, when they slander you and despise you and shut you down, is hard. Loving those who abuse or oppress you, loving those who cannot or will not love you in return, loving others when you are in such pain yourself, loving those who are nailing you to a cross, is hard. Author AllenPosted on March 28, 2016 August 24, 2016 Categories SermonsTags 1 Corinthians 15, Acts 10, Easter, Love, Luke 24, Nature of God, Resurrection, Second Great Commandment, Transformative FaithLeave a comment on An Easter Sermon: A Sissified Jesus? Christianity is unique in that it claims that God wants to physically walk with us – a point that comes out very strongly in the Gospel of Luke, in particular. So, it is not just our spirits, but also our bodily existence, that matters greatly to God. I’d like to begin with this photo. 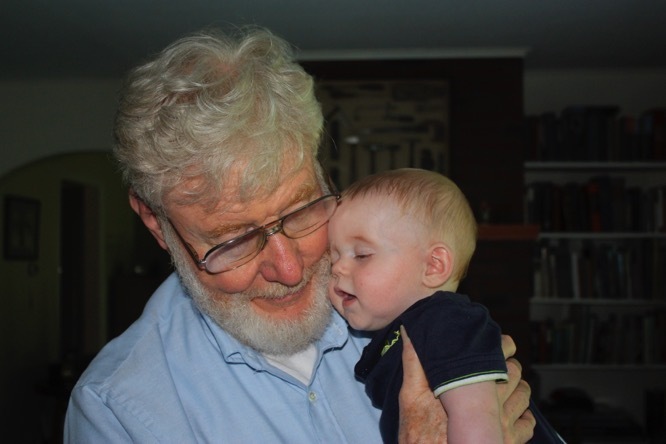 Although my Dad had held our son AJ many times before this, this was the first time that AJ really sought out a snuggle with Grandpa. It was a special moment for them, and for me too: my Father still keeps a framed print of this on his nightstand. Lord God, we lift up this morning’s message. May it touch our hearts, may it speak clearly to our souls. You have come to earth to reassure us, comfort us and heal us. You understand the importance of presence and touch. Speak to us now, Lord. Help us to love you in the ways you have wanted us to love you since the beginning, and help us learn how to actively share that love with all whom we encounter. Amen. Physical touch is such an important thing. In fact, you can find references to physical intimacy (and no, I don’t mean THAT kind of intimacy) all through the Gospels and especially in the Gospel of Luke, beginning with the infant Jesus being held by the elderly Simeon and Anna in the temple in Luke 2, to the woman washing Jesus’ feet and drying them with her hair in Luke 7, to Judas the Betrayer (as a counterexample) hugging and kissing Jesus in Luke 22, and ending with Jesus request that the disciples touch him in this morning’s reading from Luke 24. As I’m sure you know, research has shown that children who are not cuddled and lovingly held on a frequent basis, starting at birth, do not thrive: they do not develop as fast, and are not as healthy. Even now, at age 5, AJ still reaches for Mommy or Daddy, or his teacher, when he’s distressed. A hug, or even just the touch of a hand, will reassure him, calm him, and help him find stability. And then, once he’s there – he’s off again: playing, tromping in the mud, and climbing on everything! How many of you remember Leo Buscaglia? Good Friday is the day when we hear the first half of this story, where we mourn the death of Christ – and claim him as one of our own. 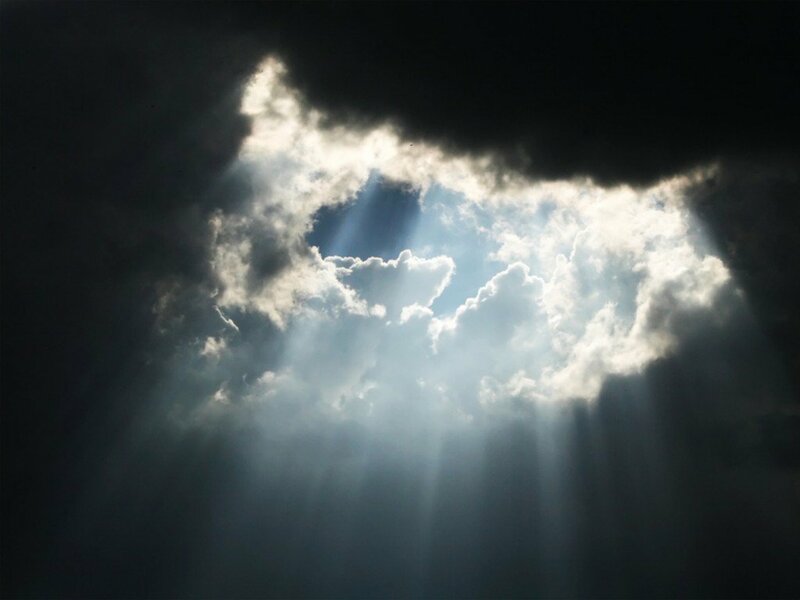 And now, on Easter, we hear the rest of the story, the Divine did not relinquish its claim on Jesus either, but instead raised him from the dead. He is the missing link: we and God both claim him for our own. God has saved us through Christ, just as Jesus told Nicodemus so long ago. Jesus binds us together as members of the Body of Christ, and as children of God. The resurrection is a living reality. But, unless we come to know Christ in the depths of our hearts, unless we take the risk of claiming Christ for our own, the resurrection will never be a living reality for us. On Easter, we celebrate the heart of our faith, the story of Christ’s death and resurrection. Why is it so important? How does this narrative bridge the gulf between Human Sin and Divine Grace? And, why does this Act of God from two Millennia ago matter to us today? Lord God, we lift up this morning’s message. May it touch our hearts, may it speak clearly to our souls. We know that your Word and your love have bridged the huge chasm that separates us from you, and affirmed that all of us are your beloved children. Speak to us now, Lord. Help us to know you in the ways you have wanted us to know you since the beginning. Amen. Three years ago, I visited the Church of the Holy Sepulcher in Jerusalem, the place at the heart of the events of Easter. As you enter that Church, to your right and up a flight of stairs, is the shrine of the Crucifixion. To the left, what would be behind me and deeper into the church, is the Shrine of the Tomb. So, on one side is the place where our Sin brought about the death of our Savior; and on the other is the spot where he was resurrected by the Grace of God. Man’s Sin sent Jesus to his death, and God’s Grace brought him back, but what ties the two together? The answer is in front of you, unavoidable as you enter the Church: the Stone of Unction. It is a simple stone, unadorned, surrounded by a few lamps, and just long and wide enough for a body. On the wall behind it is a modern mural that depicts the event that took place at this spot, where Joseph of Arimathea and the Pharisee named Nicodemus laid Jesus’ body after taking it down from the Cross. “Unction” means “anointing,” and it is here on this stone that they washed Jesus’ body, anointed it with oil, and prepared it for burial. Why is this important? Why did the designers of this Church orient it such that this spot is right in front of you as you enter the church? And, why is the building laid out such that you must pass by it a second time as you go from Calvary to the Tomb? In other words, why does it matter? Let’s start by imagining what would have happened if Joseph and Nicodemus had not taken Jesus ‘ body down from the Cross. This week in Boston, we’ve seen so many people in our community coming together to minister in many ways to those who wounded, whether visibly or not, by this tragedy. This reflects how Jesus called upon his disciples to love one another and minister to each other, especially in times if crisis, as we see in this morning’s scripture. It is a story we know all too well – but the disciples didn’t know it, yet. This week in Boston, we’ve seen so many people in our community coming together to minister in many ways to those who have been wounded, whether visibly or not, by this tragedy. This reflects how Jesus called upon his disciples to love one another and minister to each other, especially in times if crisis, as we see in this morning’s scripture. It is a story we know all too well – but the disciples didn’t know it, yet. What the disciples knew was that Jesus had just washed all of their feet, and told them that if they truly love him they must follow his example by ministering to one another, as he had. He then foretold his imminent betrayal by one of their own. Finally, Judas accepted an offering of bread and vanished into the night on some unknown errand. It was the evening of the “Last Supper.” The disciples had taken shelter from the darkness outside in the cherished, annual celebration of their love and connection with each other, and with the people of God. We remember and celebrate this even today, in the sacrament of communion. The sharing of the bread is seen as the sharing of the Body of Christ that has been broken for us. By eating of it, we are sharing in his life, in his death, and in the resurrection. By eating of it together as a community, we are acknowledging that we are all part of the Body of Christ here on earth, working together to continue His ministry and to make manifest the Kingdom of God that is already all around us, even though we may not yet see it in all of its glory and perfection. Judas took his piece of that bread as he left the light and warmth of his companions, and his Lord, as he retreated into the night. Why did John think it so important to preserve the memory of this strange offering to the Betrayer? Judas is someone to be shunned, damned and forgotten for all time – why remember anything about him at all? Was that gift just for Judas? I doubt it. No passage in the scriptures has just one lesson for us – or I’d be out of a job! Presented at Sudbury Clergy Association’s Ecumenical Good Friday Service at the Martha Mary Chapel at the Historic Wayside Inn, Friday, March 29, 2013. Seeing this Cross laid out here behind me, I am reminded of my visit last year to the Church of the Holy Sepulcher in Jerusalem, the focal point of the events that take place in our reading from the Gospel of John, and the site of the central narrative of our faith, which we remember in this Good Friday service and on Easter: the story of Christ’s death and resurrection. As you enter that Church, above and to your right, up a flight of stairs, is Calvary, the site of the Crucifixion. To the left, what would be behind me and deeper into the church, is the tomb. So, on one side is the place where our sin cost the life of our Savior; and on the other, the spot where he was resurrected by the Grace of God. Man’s Sin sent him to his death, and God’s grace brought him back, but what ties the two together? How do we bridge the gulf between man’s sin and God’s grace? 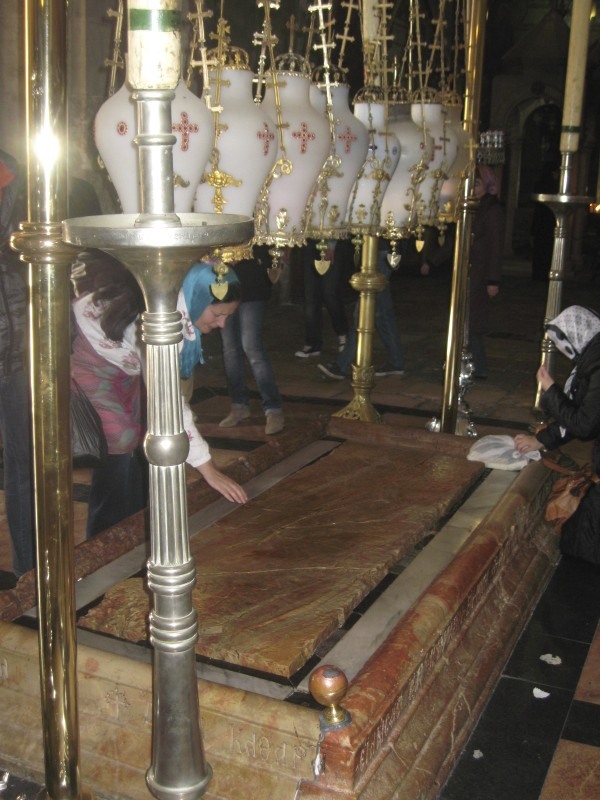 The Stone of Unction: the spot where Jesus’ body was laid when first taken down from the Cross. Church of the Holy Sepulcher, Jerusalem. The Stone of Unction: What are You Going to Do? Presented at a joint Ecumenical Service at Christ Lutheran Church, West Boylston, MA; April 6, 2012 (Good Friday). Seeing this beautiful Cross laid out here before us this evening, I am reminded of my recent visit to the Church of the Holy Sepulcher in Jerusalem, the focal point of the events that take place in this evening’s reading from the Gospel of John, the central narrative of our faith, which we remember in this Good Friday service, as well as on Easter, the story of Christ’s death and resurrection. This stone marks where Joseph of Arimathea, a prominent member of the High Council in Jerusalem, and the Pharisee named Nicodemus, a leader of the Jews; laid Jesus’ body after taking it down from the Cross. It was there that they washed Jesus’ body, anointed it with oil, and prepared it for burial. Why is the Stone of Unction important? Why did the builders of that Church orient the building such that this spot is so close to the main entrance? Why is the building laid out such that you must pass by the Stone of Unction as you go from the Cross to the Tomb? In other words, why does it matter? Let’s start by thinking about what would have happened if Joseph of Arimathea and Nicodemus had not taken the body of Jesus down from the Cross. 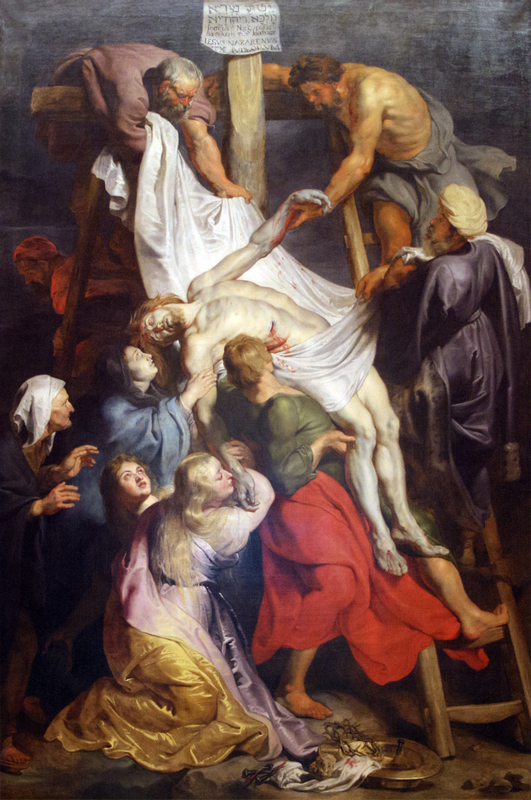 Author AllenPosted on April 6, 2012 April 21, 2014 Categories SermonsTags Calvary, Church of the Holy Sepulcher, Cross, Easter, Good Friday, John 19, Joseph of Arimathea, Nicodemus, Resurrection, Salvation, Stone of Unction, UnctionLeave a comment on The Stone of Unction: What are You Going to Do?